I tried creating a meal plan last week but I failed sticking to it by day 2. 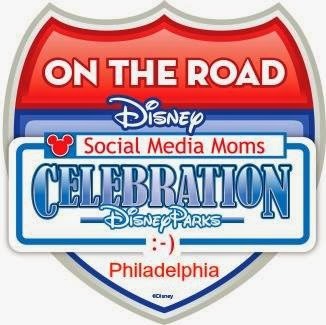 So this week I'm sticking with the meal plan in my head, and this blog post is going to talk about FUN! I wrote about the classic summer fun we've been having in a previous post. 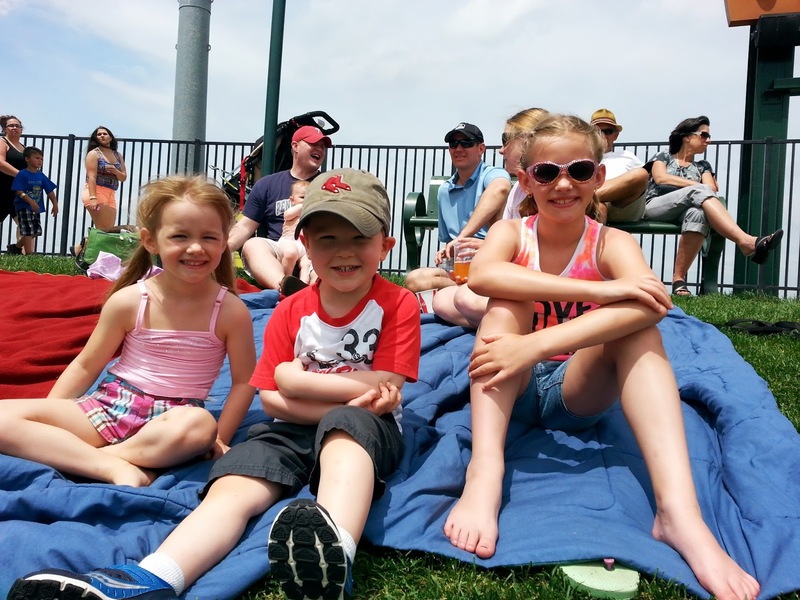 I just wanted to write a little more about two fun baseball game experiences we had recently. Local Philly readers may especially want to check it out. 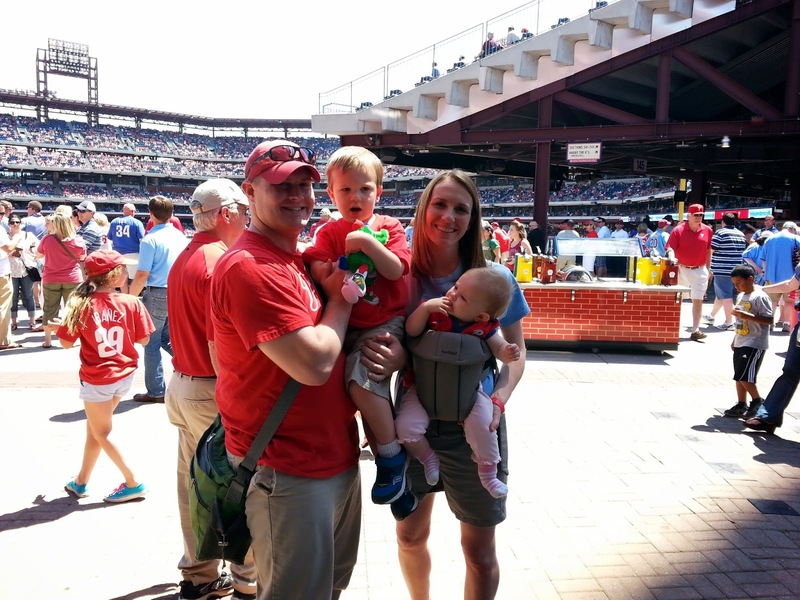 A few weeks ago we attended a Phillies game which was planned by The Husband's work. Here's a photo of us before we made a quick exit due to tired little loves. We stayed for about 5 innings which was long enough with two antsy little ones! Here we are at Citizens Bank Park to watch the Phillies. 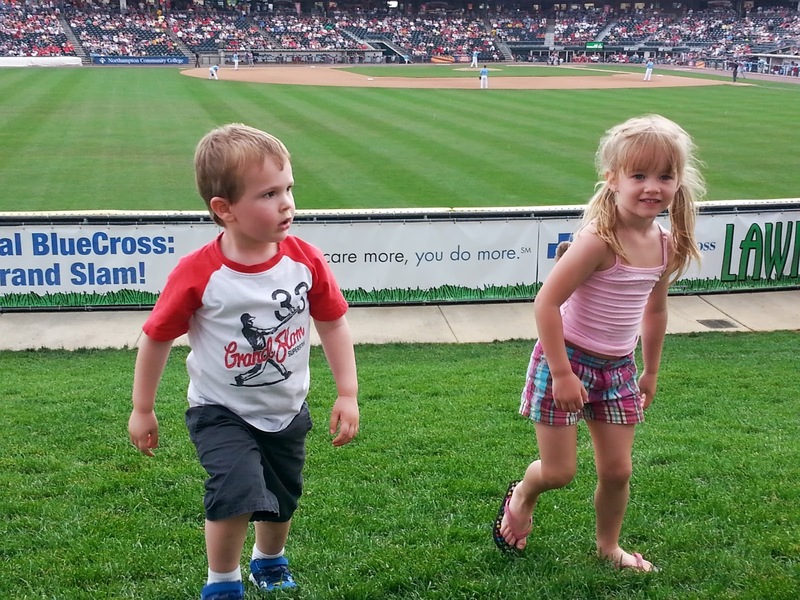 The Iron Pigs stadium has extra-long golf-carts ready to transport you from the parking lot to the stadium. Little Guy probably had just as much fun riding the golf carts as he did at the baseball game! 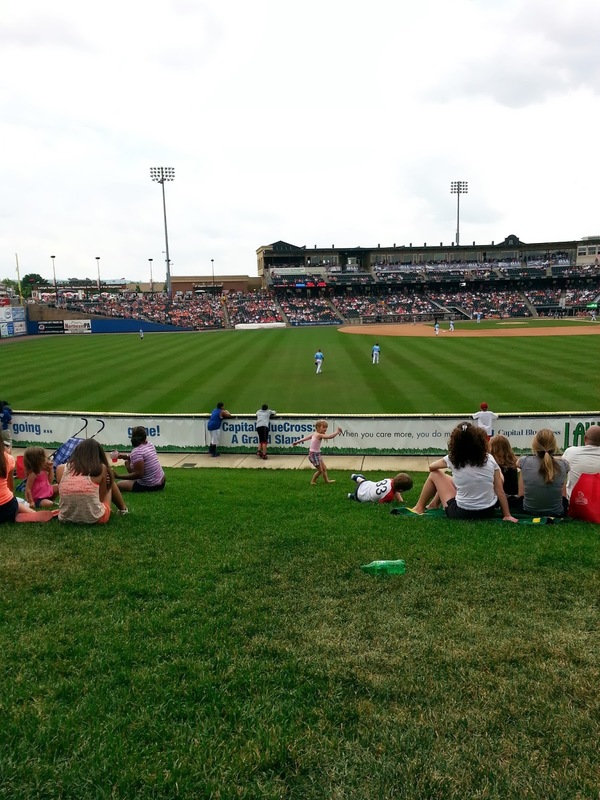 The Iron Pigs offers lawn seating in the outfield. Great for a 3 year old to run around and a 9 month old who just wants to crawl and move around! There's an accessible kid-friendly playground and game area near the outfield seating. You have to pay for it, but it's nice to have an option for another activity. You can see the bullpen if you look down over the lawn seating wall. Little Guy yelled down to the pitcher (in a nice way of course) and he threw a baseball up to him to keep! Thrilling for any kid! Tickets are cheaper than the Phillies, and despite it taking about an hour to get to the Iron Pigs stadium, it was a calmer drive than the usual Philly craziness. Here's Little Guy with friends who met us there. He's loving every minute. The kids loved walking up and down the lawn area. Parents, please just watch for fly balls though! 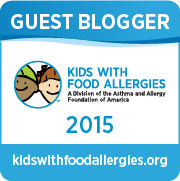 Parents of children with food allergies - please watch for food in the lawn - especially peanut shells! I do understand why many parents only feel comfortable taking their kids with food allergies to peanut-free baseball games or sections. We had to be very aware and careful during the whole game. 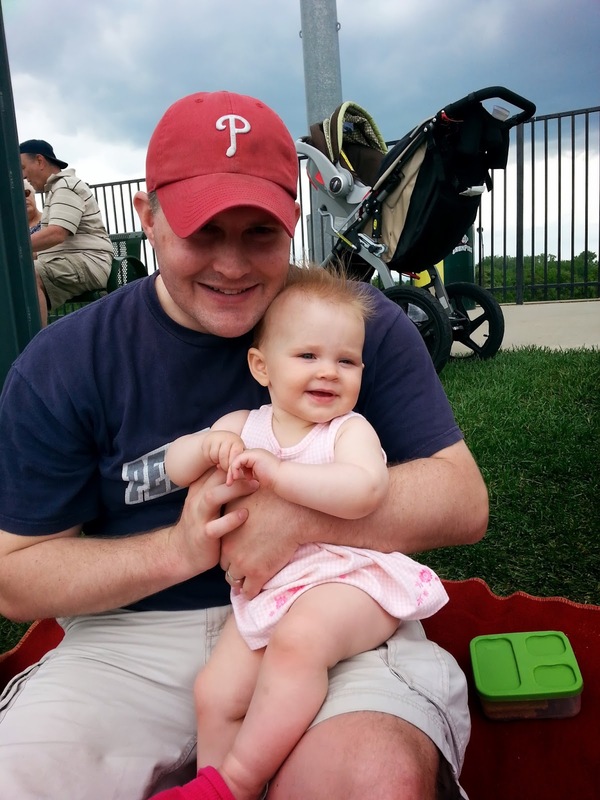 Little Gal loved sitting with Daddy. She had a head full of sunscreen because she wouldn't keep on her hat! If you look close you can see Little Guy and his friend running and rolling down the hill. We had so much fun at both games. I have to say I didn't watch much baseball at either game. It's so hard to do when the little kiddos are there too! But you definitely don't have to be a baseball fan to have fun. It's just a spirited environment and a great activity to do on a summer day. What's your favorite baseball stadium for kids? And if you have a child with peanut allergies, do you only attend peanut-free games or sit in peanut-free sections?